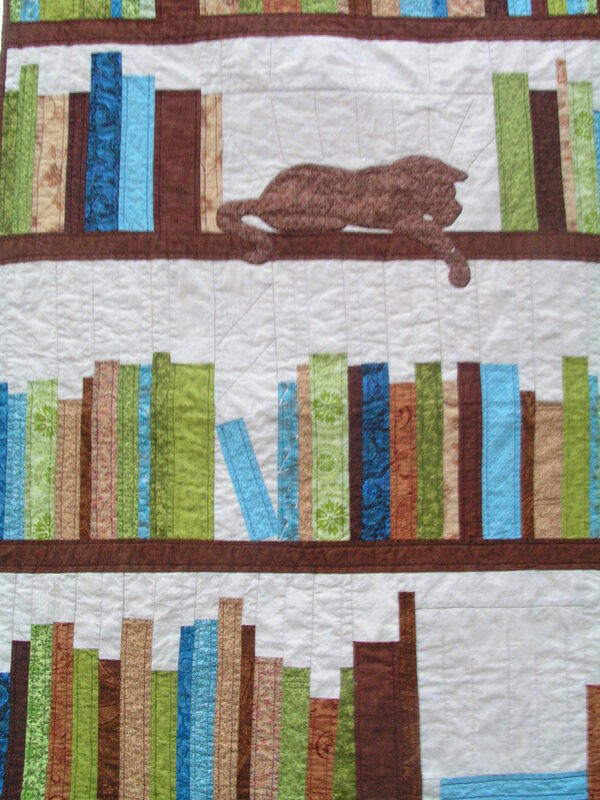 I’m joining up with the Blogger’s Quilt Festival; how fun is that! You’ll definitely want to go surf around some of the amazing quilts posted in categories that range from baby quilts to applique to hand quilted to — amazing. Good thing I’m done grading because I’m definitely looking forward to web surfing and finding some new quilter’s blogs. My regular blog followers have already seen this quilt since I was busting at my seams to reveal it, but it’s the one that I want to enter into the quilt festival since it’s the most meaningful quilt I’ve made this year (don’t hold it against me that I’ve only completed two so far this year). 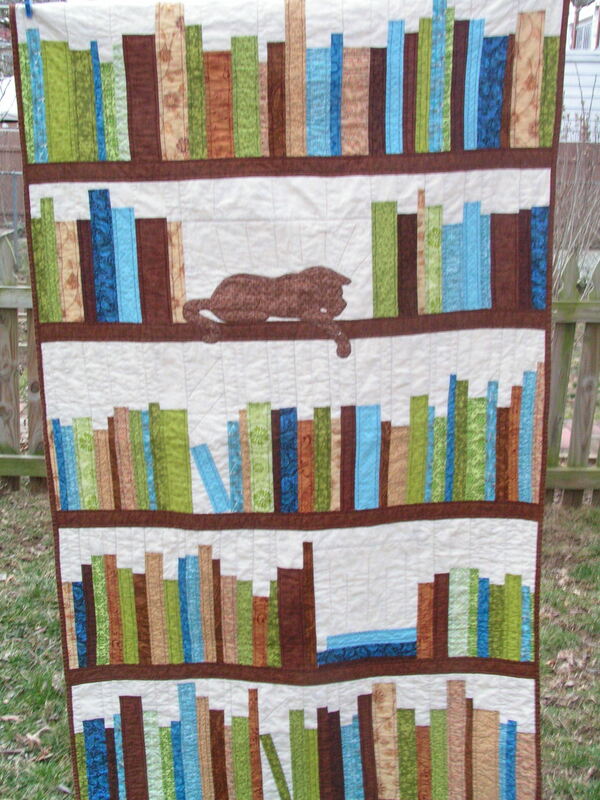 I sewed late into the night on more than one occasion to make sure that I could get this quilt delivered to my book and cat loving grandma before she went in for her third round of chemotherapy. She took it along to her treatment, and she said that while other patients thought she was dozing off, she heard them talking about how beautiful the quilt was. I’ve always thought that my grandma is beautiful because her beauty radiates from the inside out. It’s the best beauty to have because the ravages of cancer find it hard to beat the beauty that comes from inside a person. However, grandma is like all women, and losing her hair to the chemo has been tough on her. I was glad that she could have something tangible to wrap in that made her still feel special since she doesn’t always believe the family when we tell her that we don’t mind her wispy, fly away hair as it grows back in. I think I’ve still got some lessons to learn before I do any more cat appliques, but she was tickled pink — one of her well-used expressions — that I put the cat on there. Cats and my grandma are like peanut butter and jelly — it’s hard to think of them separately. And, then I picked out this background fabric to give the quilt a feminine feel while still keeping the quilt dignified. Of course, it was a little tough to concentrate since there was a techno-drum beat steadily pulsing in the background the whole evening while I was trying to pick the fabric. Techniques used: I machined pieced and quilted this quilt using a pattern from The Modern Quilt Workshop by Bill Kerr and Weeks Ringle. 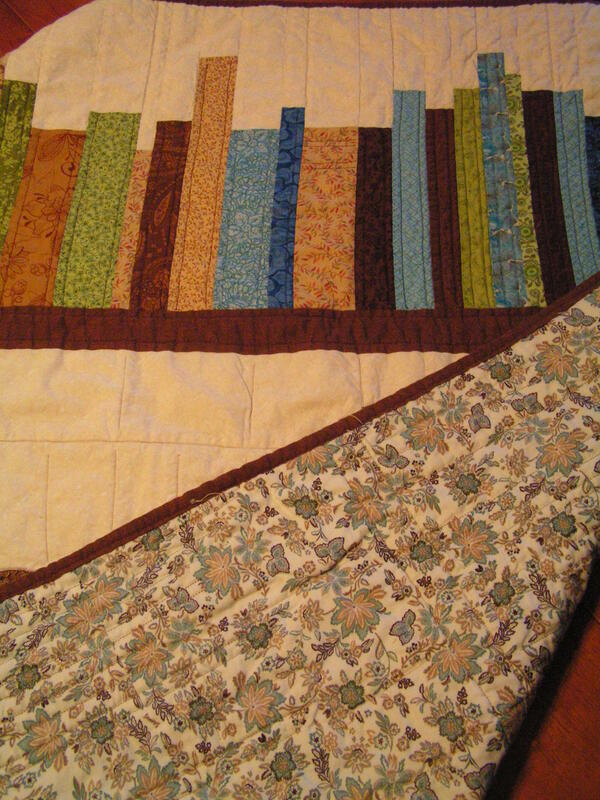 I used my walking foot for the quilting and kept the bobbin thread the same color while switching out the top thread to try to match it to the books. Don’t forget to go visit the rest of the quilt festival. If you were going to sweep your floor or bake a cake, you can do it tomorrow. Brew a cup of tea and enjoy! Your quilt is beautiful and I’m sure your grandmother appreciates it very much, very thoughtful of you…you have your grandmother’s beauty. Sue, thank you for those kind words. They are much appreciated. Your grandma must have loved this quilt! There’s so much love stitched into it, and in your beautiful words. Thanks for sharing your finished quilt. Thanks for stopping by to look at it. It was a project that I enjoyed. Just what quilting should be about. It’s a lovely quilt. Oh I love this quilt especially since you made it for your grandmother! I can’t imagine how happy she must be to have it! Thanks for sharing it with us. So nice to do something so lovely for your grandmother! Thanks! I love the crayon challenge posted at your quilt guild page. Everyone came up with such beautiful creations!